There’s no doubt about it — Chip Kelly changed the game of college football and Oregon was blessed to have him during his short tenure. 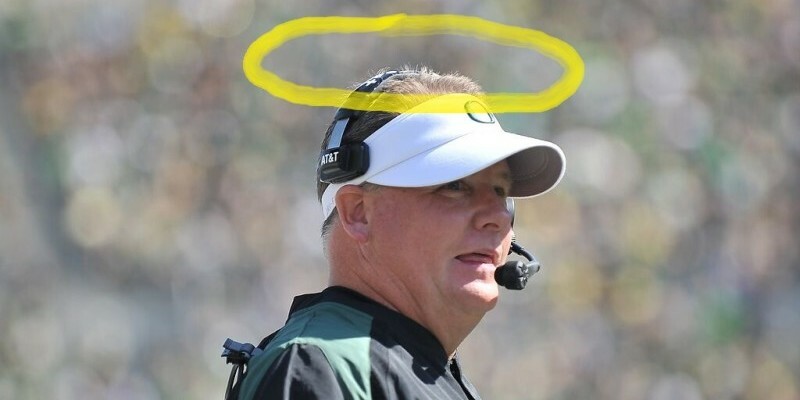 But there’s a segment of Oregon football fans who have taken it a step further and anointed the Chipster with sainthood. It seems that in everything from recruiting to play calling, anything that goes wrong with Oregon football is caused by one reason and one reason only: Mark Helfrich just can’t measure up to the legend of St. Chipstopher. Just like the case of that hot girl (or guy, for our female readers and male readers of alternative persuasion) in high school who — too hot for the likes of you — moved on and left you on your own to find someone more committed — it’s well past time to get over it. While a great football coach, Kelly doesn’t deserve our worship at the expense of Helfrich, so why we should toss out our St. Chipstopher medals is the subject of this week’s Three-and-Out. 1. There’s more to the program than that. The myth is that Kelly took the Oregon football program to places it had never been before and will never see again. The reality is that Oregon had a pretty solid program before Kelly arrived, and has since. 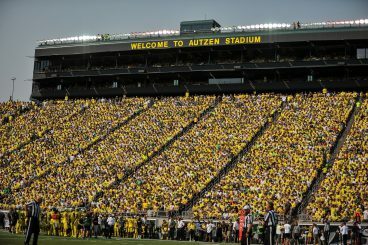 Autzen Stadium is part of the mystique that is Oregon football — even with Chip Kelly gone. Kelly’s predecessor, Mike Bellotti, had only one losing season during his 14-year tenure and his 2001 team finished the season ranked No. 2 in both major polls, with only a miscarriage of justice keeping the team out of the national championship game. In 2010 — Kelly’s second year at the helm — the Ducks made it to the national championship game, but lost to Auburn. In 2011, Kelly picked up a Rose Bowl win over Wisconsin. 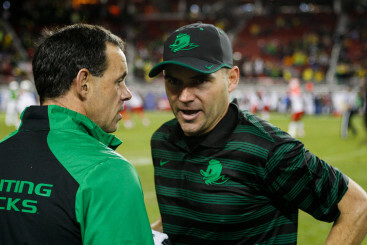 Since Kelly, Helfrich has coached the Ducks to a Rose Bowl win and a loss in the national championship game. So what Kelly achieved during his brief tenure at Oregon is nothing that hadn’t been accomplished previously or hasn’t been accomplished since. 2. Willie Lyles. Yes, we’d like to forget about it, but the Willie Lyles scandal dampened recruiting during Kelly’s last two years and left the program with recruiting sanctions. The loss of one scholarship per year for three years is no big deal, but the reductions in allowed official evaluations and the reduction in allowed official paid visits (which expires after the current recruiting cycle) from 56 to 37 have hampered recruiting. The sanctions likely would have been worse had Kelly not already moved on to the NFL. The NCAA hit Kelly with a year-and-a-half ban from college football. With Kelly already under contract with the Philadelphia Eagles, the NCAA’s move was pretty much akin to a wimpy kid cussing out a bully as soon as he was out of earshot, but given the circumstances of the case, it didn’t exactly qualify Kelly for martyrdom. 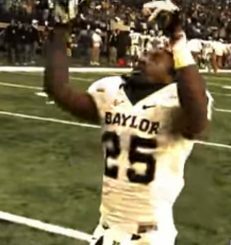 Kelly’s recruiting was not error-free — Lache Seastrunk, for example. The bottom line for those glorifying Kelly’s recruiting at Helfrich’s expense is that Kelly brought the Ducks Lache Seastrunk — who was at the center of the Lyles scandal and never played a down for the Ducks — and Helfrich brought the Ducks Marcus Mariota, who … well, you know the rest of that story. 3. Four-and-Out. Kelly coached the Ducks for four glorious seasons and four BCS games, winning two and losing two. But in addition to the Lyles scandal, he also flirted with the NFL his last two years at the helm, creating an aura of uncertainty unbecoming a program that has been built on coaching stability. A four-year record of success is not a legacy. It’s a flash in the pan. A long-term commitment was never part of the deal with Kelly. Now take a look at all of the highly successful programs — long-term commitment of coaches is always part of the deal. No program comes back to the championship table year after year having coaches who are committed for two years and then hanging by a thread for another two before departing. The Kelly years were exciting, but Kelly wasn’t about to stick around for the long haul. If he had, it was inevitable that some of the years wouldn’t have produced as great of results as others. In fact, Kelly hit his high point in his second year with the trip to the national championship game, and the final two years, though successful, carried enough disappointment to preclude a trip back. And if Kelly had stuck around long enough, he would have hit one of those years where everything blew up in his face. But he didn’t, and at the moment he has a 3-3 record with the Philadelphia Eagles. By the time you read this, it will be either 3-4 or 4-3 — fairly human either way. As it is, you could easily argue that Kelly was the beneficiary of the loaded cupboard that Bellotti left behind and the Heisman-winning quarterback that Mark Helfrich recruited for him. Kelly left big shoes to fill, and Helfrich has filled them well. Kelly wasn’t at Oregon long enough to survive the test of time. And in addition to the seemingly loaded roster he left behind, he also left Helfrich with a bit of a mess to clean up — a mess that contributed to the inexperience in the secondary and quarterback position that is currently weighing the program down. Kelly was a flash in the pan, but the Oregon football program — despite a sluggish start to the current season — is much more than that. Three different coaches have taken the program to the brink of the very top of the college football food chain, all in the past 14 years alone. And though the season so far has been less than sterling, the young secondary will mature and the next star quarterback will emerge, all without any help from Chip Kelly.